In 2004 I began teaching physics and mathematics as an undergraduate at North Carolina State University. From the spring of 2004 until I was a graduate student in the middle of 2008 I taught courses which ranged from beginning calculus to modern physics labs. During my postdoc at Notre Dame, I mentored undergraduates and expanding the Joint Institute for Nuclear Astrophysics (JINA) outreach initiatives in collaboration with Dr. Micha Kilburn. Since beomcing staff at Los Alamos National Laboratory, I have continued my mentoring effort by supporting summer students as well as postdocs. Project Trevor joined the Aprahamian research group late in the fall semester 2013 to work with me on a new reaction network framework. Reaction networks are used in nuclear astrophysics to time evolve the composition of stars and stellar explosions. Over the course of 2014 Trevor designed a framework for nucleosynthesis calculations which can be applied to environments from the Big Bang to the rapid neutron capture or $r$-process believed to occur in supernova explosions. Trevor, also a math major, has used concepts from Gödel's incompleteness theorems and sparsity of the network matrices to greatly speed up these calculations. 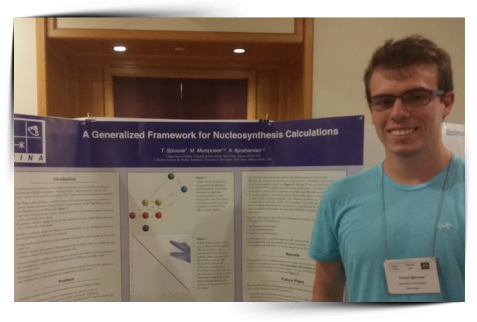 In the fall of 2014 Trevor presented this research project at the Division of Nuclear Physics conference held in Hawaii. Project Patrick joined the Aprahamian research group in the spring semester of 2013 to work with me on a new database of nuclear physics properties. In the first phase of this project Patrick learned about the properties of nuclei. He then designed a complex database structure in MySQL to store this information. Patrick continues to contribute to the database project in his spare time. Patrick has also studied the emission of neutrons during thunderstorms. He submitted a proposal to the Nanovic Institute for European Studies at Notre Dame and was awarded a prestigious travel grant allowing him the opportunity to spend ten weeks in Armenia over summer 2013 at the Yerevan Physics Institute, a leading research center in high energy cosmic rays specializing in neutron emission from thunderstorms. 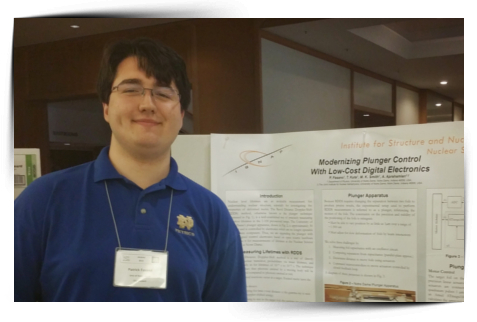 Project Tim joined the Aprahamian research group late in the fall semester 2013 to work with me on the Notre Dame Nuclear Database project. Since Patrick Fasano's initial work on the database it has grown into a large scale project. Tim's focus on this project has been writing the interface between the backend (the database) and the frontend (the web and command line interfaces). Over the course of 2014 Tim wrote Python code which defines the project's API (application protocol interface). This standard allows for well-defined interactions with the database which includes search queries and filtering by metadata. 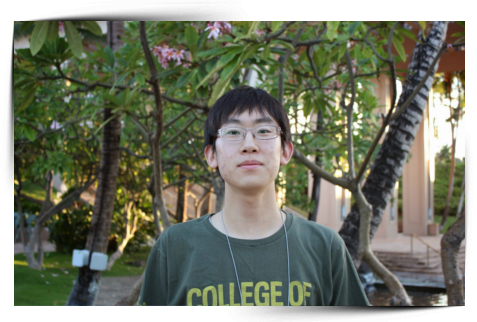 In the fall of 2014 Tim presented this research project at the Division of Nuclear Physics conference held in Hawaii. Project Caleb joined the McLaughlin research group in the summer of 2011 to work with me on sensitivity studies of $r$-process nuclei. 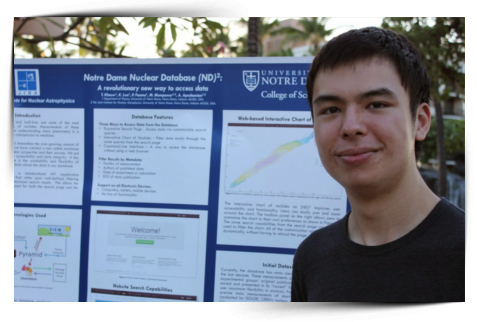 Over the course of the summer and his senior year he learned to perform simulations of $r$-process nucleosynthesis in various astrophysical environments. Caleb's focus was finding the most important $\beta$-decay rates that contribute to the final abundances we observe in nature. These rates are important to isolate as they are one of the primary motivations for measurements of neutron-rich nuclei at radioactive beam facilities. Caleb presented his work at the spring 2012 undergraduate research symposium at NCSU. 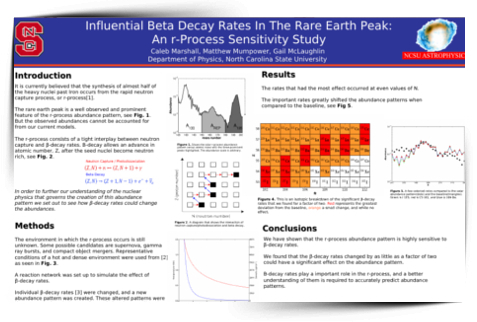 His work will be featured in an upcoming publication on $\beta$-decays of rare earth nuclei. © Matthew Mumpower (2007-2019). All Rights Reserved.